The 2015 Adelaide Zoo Giant Panda breeding season has seen a flurry of activity since Saturday to help assist Wang Wang and Fu Ni on their journey to parenthood. The team has worked around the clock during the pandas’ short, yearly reproductive window to maximise a positive result. Giant Panda reproductive specialist Professor Tang of the China Conservation and Research Centre for the Giant Panda helped breeding season activities and was supported by reproductive fertility experts from Repromed who analysed daily urine samples to determine the peak of Fu Ni’s oestrous cycle. Natural breeding efforts this year again proved positive. This year, for the first time, introductions took place outside. This resulted in the pandas displaying very natural behaviours. 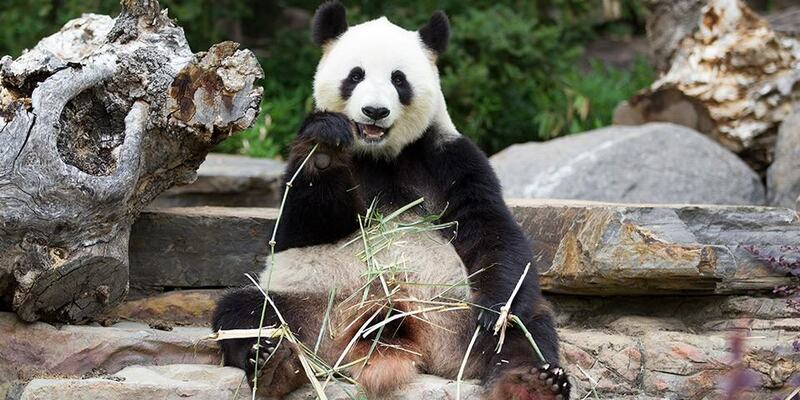 Fu Ni climbed the main tree in the habitat and Wang Wang bleated to her from below. On several occasions Wang Wang climbed the tree and met her half way where they playfully batted at each other. This behaviour is similar to pandas in the wild in that female pandas will climb trees while males congregate below and fight for mating rights. When the female begins to ovulate, she’ll come down from the tree and mate with the victorious male. While behaviours displayed were great a step forward, as the 36 hour fertility window started to draw to a close and mating had not yet occurred, the team made the decision to proceed with artificial insemination. We’re thrilled to announce, two successful artificial insemination procedures were carried out on Fu Ni. This reproductive aid, commonly associated with breeding Giant Pandas in captivity, has a 50+ percent success rate due in part to pandas’ complicated reproductive biology and the difficulty in confirming pregnancy. We’re now treating Fu Ni as if she’s pregnant, although we’ll not be able to confirm she’s officially with cub until approximately two weeks before she would potentially give birth. The Bamboo Forest will be closed for the next few days to give Fu Ni some peace and quiet to maximise the chance of success.This result is an important step forward, and the furthest Adelaide Zoo has come to reaching our ultimate goal of breeding our very own Giant Panda cub. We’ll provide further updates on the pandas here and on Facebook and Twitter using the hash tag #ADLpandas.